Roasted chicken with potatoes is one of the most popular and universally liked foods. Almost everyone loves chicken with potatoes, making it such a popular choice for a Sunday dinner. 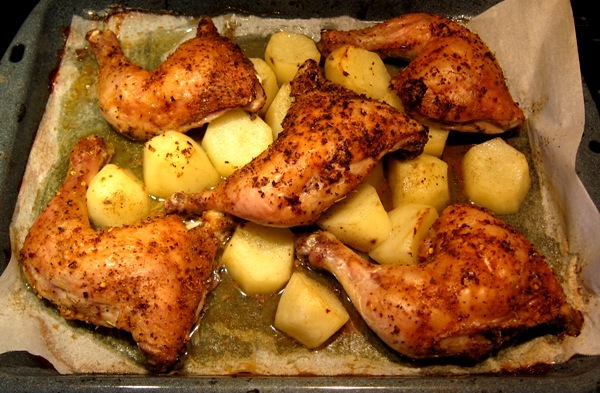 Baking chicken together with potatoes on the same baking sheet allows the potatoes to absorb chicken flavors, making them taste very well seasoned and delicious. Oven roasted chicken with potatoes gives you a main dish and a side dish all in one, with very little work to do and just one baking sheet to clean. Just rub the chicken with the seasoning mix, put on a baking sheet, add the potatoes to the chicken and bake. The oven does all the work – the house will smell like a delicious roasted chicken and the dinner will be ready! I always have some chicken legs or thighs in my freezer just in case, so I know I can always make dinner out of them 🙂 Just thaw them overnight in the refrigerator or quickly defrost them in a microwave, and you have the ingredients to make roasted chicken! Toss in a few potatoes from the pantry, and you’ve got delicious homemade roast chicken and potatoes! 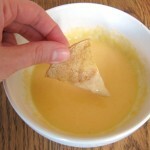 Just follow my easy recipe for this delicious and foolproof meal. 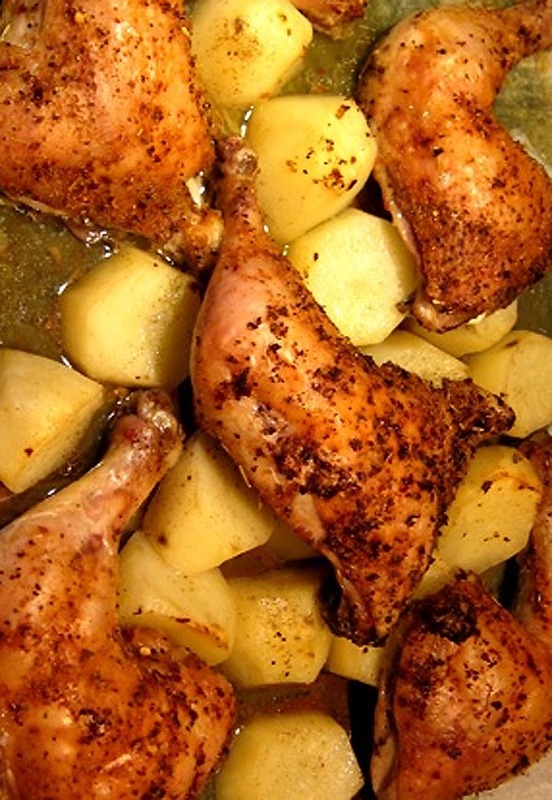 Chicken and potatoes are baked in the oven to make a delicious one-dish dinner! This makes the main dish and side dish all at once, and the oven does all the work! Line the baking sheet with parchment paper so it doesn't stick. Rub the chicken pieces with the chicken seasoning mix. Put the chicken on a baking sheet. Put the potatoes in between the pieces of chicken. Put the chicken and potatoes in the oven and bake for 1 hour. 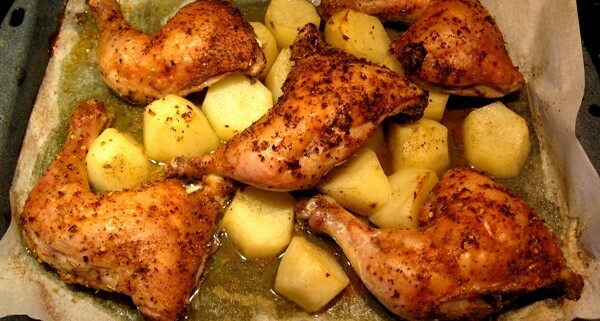 Enjoy this yummy chicken with potatoes! It’s perfect served with simple green salad with tomatoes and cucumbers. 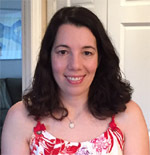 For more great easy chicken recipes, check out two ingredient crockpot chicken stew, baked bbq chicken recipe and buttermilk chicken legs recipe. What brand of chicken seasoning did you use in this recipe. I used Weber Kick’n Chicken Seasoning brand. Do you cover while cooking? Made this last night. So easy and so delicious. Both the chicken and the potatoes were fork tender. And because I sprinkled the potatoes with some chicken seasoning along with the salt and pepper, they were full of flavor too. 5 stars! Thank you for posting this. 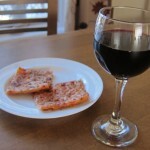 What Wine Goes Best With Pizza?